Barbara Jill Walters (born September 25, 1929) is an American broadcast journalist, author, and television personality. Walters is known for having hosted a variety of television programs, including Today, The View, 20/20, and the ABC Evening News. Since retirement as a full-time host and contributor, she continued to occasionally report for ABC News through 2015. Walters first became known as a television personality in the early 1960s, when she was a writer and segment producer of "women's interest stories" on the NBC News morning program The Today Show, where she began work with host Hugh Downs. As a result of her outstanding interviewing ability and her popularity with viewers, she received more airtime on the program. Even though her production duties made her a significant contributor to the program, she had no input in choosing a successor for Downs when he left in 1971, and Frank McGee was hired. In 1974, at the time of McGee's death, Walters became co-host of the program, the first woman to hold such a title on an American news program. In 1976, continuing as a pioneer for women in broadcasting, she became the first female co-anchor of a network evening news, working with Harry Reasoner on the ABC News flagship program, the ABC Evening News, earning an unprecedented US$1 million per year. From 1979 to 2004, she worked as co-host and a producer for the ABC newsmagazine 20/20. In 1997, Walters created and debuted as a co-host on The View, a daytime talk show with an all-female panel. She retired as a co-host of The View in 2014 after 16 seasons, but still serves as its executive producer. Since her retirement from The View, she has hosted a number of special reports for 20/20 and ABC News, as well as a documentary series for Investigation Discovery. Additionally, Walters continued to host her annual 10 Most Fascinating People special on ABC. Her final on-air appearance for ABC News was in 2015. In 1996, Walters was ranked #34 on the TV Guide "50 Greatest TV Stars of All Time" list, and in 2000 she received a Lifetime Achievement Award from the National Academy of Television Arts and Sciences. 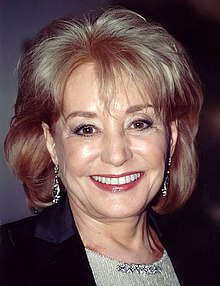 Barbara Walters was born in 1929[sources 1] (although Walters herself has claimed 1931 in an on-camera interview) in Boston to Dena (née Seletsky) and Louis "Lou" Walters (born Louis Abraham Warmwater). Her parents were both Jewish, and descendants of refugees from the former Russian Empire. Walters' paternal grandfather, Abraham Isaac Warmwater, was born in Łódź, Poland, and emigrated to the United Kingdom, changing his name to Abraham Walters (the original family surname was Waremwasser). Walters' father, Lou, was born in London c. 1896 and moved to New York with his father and two brothers, arriving August 28, 1909. His mother and four sisters arrived in 1910. In 1949, her father opened the New York version of the Latin Quarter. He also worked as a Broadway producer where he produced the Ziegfeld Follies of 1943. He also was the Entertainment Director for the Tropicana Resort and Casino in Las Vegas, Nevada, where he imported the "Folies Bergère" stage show from Paris to the resort's main showroom. Walters' brother, Burton, died in 1944 of pneumonia. Walters' elder sister, Jacqueline, was born mentally disabled and died of ovarian cancer in 1985. According to Walters, her father made and lost several fortunes throughout his life in show business. He was a booking agent, and unlike her uncles who were in the shoe and dress business, his job was not very safe. During the good times, Walters recalls her father taking her to the rehearsals of the night club shows he directed and produced. The actresses and dancers would make a huge fuss over her and twirl her around until she was dizzy. Then she said her father would take her out for hot dogs, their favorite. According to Walters, being surrounded by celebrities when she was young kept her from being "in awe" of them. When she was a young woman, Walters' father lost his night clubs and the family's penthouse on Central Park West. As Walters recalled, "He had a breakdown. He went down to live in our house in Florida, and then the government took the house, and they took the car, and they took the furniture." Of her mother, she said, "My mother should have married the way her friends did, to a man who was a doctor or who was in the dress business." Walters attended Lawrence School, a public school in Brookline, Massachusetts, to the middle of fifth grade, when her father moved the family to Miami Beach in 1939, where she also attended public school. After her father moved the family to New York City, she went to eighth grade at Ethical Culture Fieldston School, after which the family moved back to Miami Beach. Then, she went back to New York City, where she attended Birch Wathen School from which she graduated in 1947. In 1951 she received a B.A. in English from Sarah Lawrence College and immediately looked for work in New York City. After about a year at a small advertising agency, she began working at the NBC network affiliate in New York City, WNBT-TV (now WNBC), doing publicity and writing press releases. She began producing a 15-minute children's program, Ask the Camera, directed by Roone Arledge in 1953. She began producing for TV host Igor Cassini/Cholly Knickerbocker. However, she left the network after her boss pressured her to marry him and engaged in a fist-fight with a man she preferred to date. Then she went to WPIX to produce the Eloise McElhone Show; it was canceled in 1954. She became a writer on The Morning Show at CBS in 1955. Gene Shalit, Barbara Walters, and Frank McGee in The Today Show, 1973. After a few years as a publicist with Tex McCrary Inc. and a job as a writer at Redbook magazine, Walters joined NBC's The Today Show as a writer and researcher in 1961. She moved up to become that show's regular "Today Girl," handling lighter assignments and the weather. In her autobiography, she describes this era before the Women's Movement as a time when it was believed that nobody would take a woman seriously reporting "hard news." Previous "Today Girls" (whom Walters called "tea pourers") included Florence Henderson, Helen O'Connell, Estelle Parsons and Lee Meriwether. Within a year, she had become a reporter-at-large developing, writing, and editing her own reports and interviews. One very well received film segment was "A Day in the Life of a Novice Nun," edited by then-first assistant film editor Donald Swerdlow (now Don Canaan), who was subsequently promoted to become a full film editor at NBC News. She had a great relationship with host Hugh Downs for years. When Frank McGee was named host, he refused to do joint interviews with Walters unless he was given the first three questions. She was not named co-host of the show until McGee's death in 1974 when NBC officially designated Walters as the program's first female co-host. Barbara Walters in her office, as photographed by Lynn Gilbert in 1979. Walters has seldom minced words when describing the visible, on-the-air disdain her co-anchor Harry Reasoner displayed for her when she was teamed up with him on the ABC Evening News from 1976–78. Reasoner had a difficult relationship with Walters, because he disliked having a co-anchor, even though he worked with former CBS colleague Howard K. Smith nightly on ABC for several years. In 1981, five years after the start of their short-lived ABC partnership and well after Reasoner returned to CBS News, Walters and her former co-anchor had a memorable (and cordial) 20/20 interview on the occasion of Reasoner's new book release. Walters is also known for her years on the ABC newsmagazine 20/20 where she reunited with former Today Show host Hugh Downs in 1979. Throughout her career at ABC, Walters has appeared on ABC news specials as a commentator, including presidential inaugurations and the coverage of 9/11. She was also chosen to be the moderator for the third and final debate between candidates Jimmy Carter and Gerald Ford, held on the campus of the College of William and Mary at Phi Beta Kappa Memorial Hall in Williamsburg, Virginia, during the 1976 Presidential Election. In 1984, she moderated a Presidential debate held at the Dana Center for the Humanities at Saint Anselm College in Goffstown, New Hampshire. Walters interviewing President Gerald Ford and Betty Ford in 1976. Walters is known for "personality journalism" and her "scoop" interviews. In November 1977, she achieved a joint interview with Egypt's President, Anwar Al Sadat, and Israel's Prime Minister, Menachem Begin. According to The New York Times, when she went mano a mano with Walter Cronkite to interview both world leaders, at the end of Cronkite's interview, he is clearly heard saying: "Did Barbara get anything I didn't get?" Her interviews with world leaders from all walks of life are a chronicle of the latter part of the 20th century. They include the Shah of Iran, Mohammad Reza Pahlavi, and his wife, the Empress Farah Pahlavi; Russia's Boris Yeltsin and Vladimir Putin; China's Jiang Zemin; the UK's Margaret Thatcher; Cuba's Fidel Castro, as well as India's Indira Gandhi, Czechoslovakia's Václav Havel, Libya's Muammar al-Gaddafi, King Hussein of Jordan, King Abdullah of Saudi Arabia, and Venezuelan President Hugo Chavez, among many others. Other interviews with influential people include pop icon Michael Jackson, actress Katharine Hepburn, Vogue editor Anna Wintour, and in 1980 Sir Laurence Olivier. Walters considered Robert Smithdas, a deaf-blind man who spent his life improving the lives of other individuals who are deaf-blind, as her most inspirational interview. Walters was widely lampooned for asking actress Katharine Hepburn, "If you were a tree, what kind would you be?" On her last 20/20 television episode, Walters showed video of the Hepburn interview, showing the actress saying that she would like to be a tree. Walters merely followed up with the question, "What kind of a tree? ", and Hepburn responded "an oak" because they are strong and pretty. According to Walters, for years Hepburn refused her requests for an interview. And when she finally agreed to one, she said she wanted to meet her first. Walters walked in all smiles and ready to please, while Hepburn was at the top of the stairs and barked, "You're late. Have you brought me chocolates?" Walters hadn't but said she never showed up without them from then on. They had several other meetings since that first time, mostly in Hepburn's living room where she would give Walters her opinions. Careers and marriage did not mix. Children and careers were out of the question. Walters said Hepburn's opinions stuck with her so much, she could repeat them almost verbatim to this day. Her television special about Cuban leader Fidel Castro aired on ABC-TV on June 9, 1977. Although the footage of her two days of interviewing Castro in Cuba showed his personality, in part, as freewheeling, charming, and humorous, she pointedly said to him, "You allow no dissent. Your newspapers, radio, television, motions picture are under state control." To this, he replied, "Barbara, our concept of freedom of the press is not yours. If you asked us if a newspaper could appear here against socialism, I can say honestly no, it cannot appear. It would not be allowed by the party, the government, or the people. In that sense we do not have the freedom of the press that you possess in the U.S. And we are very satisfied about that." She concluded the broadcast of the interview by remarking, "What we disagreed on most profoundly is the meaning of freedom—and that is what truly separates us." At the time, Walters kept quiet about seeing New York Yankees owner George Steinbrenner, pitcher Whitey Ford, and several coaches in Cuba, there to assist Cuban ballplayers. On March 3, 1999, her interview of Monica Lewinsky was seen by a record 74 million viewers, the highest rating ever for a news program. Walters asked Lewinsky, "What will you tell your children when you have them?" Lewinsky replied, "Mommy made a big mistake," at which point Walters brought the program to a dramatic conclusion, turning to the viewers and saying, "And that is the understatement of the year." The View's panel (left–right Whoopi Goldberg, Barbara Walters, Joy Behar, Sherri Shepherd and Elisabeth Hasselbeck) interview United States President Barack Obama on July 29, 2010. Walters was a co-host of the daytime talk show The View, of which she also is co-creator and co-executive producer with her business partner, Bill Geddie. It premiered on August 11, 1997. Walters described the show in its original opening credits as a forum for women of "different generations, backgrounds, and views." She added, "Be careful what you wish for..." on the opening credits of its second season. Through The View, she was able to clinch two Daytime Emmy Awards for Best Talk Show in 2003 and Best Talk Show Host (with longtime host Joy Behar, moderator Whoopi Goldberg, Elisabeth Hasselbeck, and Sherri Shepherd) in 2009. Walters retired from being a co-host on May 15, 2014. Although retired, Walters returned as a guest co-host on an intermittent basis throughout 2014 and 2015. Since leaving her role as 20/20 co-host in 2004, Walters remained as a part-time contributor of special programming and interviews for ABC News until 2016. On March 7, 2010, Barbara Walters announced she would no longer hold Oscar interviews, but will still be working with ABC and on The View. In a November 2010 episode of The View, while interviewing Larry King on his retirement from CNN, Walters alluded to her impending retirement, stating, "I know when my time's coming." On March 28, 2013, numerous media outlets reported that Barbara Walters would retire in May 2014 and that she would make the announcement on the show four days later. However, on the April 1 episode, Walters neither confirmed nor denied the retirement rumors; she said "if and when I might have an announcement to make, I will do it on this program, I promise, and the paparazzi guys -- you will be the last to know". Walters confirmed six weeks later that she would be retiring from television hosting and interviewing in May 2014, as originally reported; she made the official announcement on the May 13, 2013, episode of The View while also announcing that she will continue as the show's executive producer for as long as it's on the air. On June 10, 2014, it was announced that she would be 'coming out of retirement' in order to do a special 20/20 interview with Peter Rodger, the father of Elliot Rodger who had committed the 2014 Isla Vista killings. Since then, she has hosted special 20/20 episodes featuring interviews with Mary Kay Letourneau and Donald and Melania Trump. In 2015, Walters hosted the documentary series American Scandals on Investigation Discovery. Walters continued to host her 10 Most Fascinating People series in 2014 and 2015. Her final on-air interview was of presidential candidate Donald Trump for ABC News in December 2015. Walters last appeared publicly in 2016. Walters has been married four times to three different men. Her first husband was Robert Henry Katz, a business executive and former Navy lieutenant. They married on June 20, 1955, at The Plaza Hotel in New York City. The marriage was reportedly annulled after 11 months, or in 1957. Her second husband was Lee Guber, theatrical producer and theater owner. They married on December 8, 1963, and divorced in 1976. They have one daughter, Jacqueline Dena Guber (born 1968, adopted the same year). Her third husband was Merv Adelson, the CEO of Lorimar Television. They married in 1981 and divorced in 1984. They remarried in 1986 and divorced for the second time in 1992. She dated lawyer Roy Cohn in college; he said that he proposed marriage to Walters the night before her wedding to Lee Guber, but Walters denied this. She explained her lifelong devotion to Cohn as gratitude for his help in her adoption of her daughter, Jacqueline. In her autobiography, Walters says she also felt grateful to Cohn because of his legal assistance to her father. According to Walters, her father was the subject of an arrest warrant for "failure to appear" after he failed to show up for a New York court date because the family was in Las Vegas, and Cohn was able to have the charge dismissed. Walters testified as a character witness at Cohn's 1986 disbarment trial. Walters dated future U.S. Federal Reserve Chairman Alan Greenspan in the 1970s and was linked romantically to United States Senator John Warner in the 1990s. In Walters' autobiography Audition, she claimed that she had an affair in the 1970s with Edward Brooke, then a married United States Senator from Massachusetts. It is not clear whether Walters also was married at the time. Walters said they ended the affair to protect their careers from scandal. [dead link] In 2007 she dated Pulitzer Prize-winning gerontologist Robert Neil Butler. Walters is close friends Tom Brokaw and Woody Allen, and was close friends with Joan Rivers as well with former Fox News head Roger Ailes from the late 1960s until his death in 2017. In 2014, Walters appeared on CNN's Piers Morgan Live and revealed that not having more children is her greatest regret in life. She announced on the May 10, 2010, episode of The View that she would be undergoing open heart surgery to replace a faulty aortic valve. Walters added that she knew for quite a while that she was suffering from aortic valve stenosis, even though she was symptom-free. The procedure to fix the faulty heart valve "went well, and the doctors are very pleased with the outcome," Walters' spokeswoman, Cindi Berger, said in a statement on May 14, 2010. On July 9, 2010, it was announced that Walters would return to The View and her Sirius XM satellite show, Here's Barbara, in September 2010. Four years later, Walters retired permanently from both shows. Barbara Walters was inducted into the Television Hall of Fame in 1989. On June 15, 2007, Walters received a star on the Hollywood Walk of Fame. She has won Daytime and Prime Time Emmy Awards, a Women in Film Lucy Award, and a GLAAD Excellence in Media award. Her impact on the popular culture is illustrated by Gilda Radner's "Baba Wawa" impersonation of her on Saturday Night Live, featuring her idiosyncratic speech with its rounded "R". In 2008, she was honored with the Disney Legends award, an award given to those who made an outstanding contribution to The Walt Disney Company, which owns the network ABC. That same year, she received the Lifetime Achievement Award from the New York Women's Agenda. On September 21, 2009, Walters was honored with a Lifetime Achievement Award at the 30th Annual News and Documentary Emmy Awards at New York City's Lincoln Center. 1998 Lucy Award in recognition of her excellence and innovation in her creative works that have enhanced the perception of women through the medium of television. In the late 1960s, Walters wrote a magazine article, "How to Talk to Practically Anyone About Practically Anything", which drew upon the kinds of things people said to her, which were often mistakes. Shortly after the article appeared, she received a letter from Doubleday expressing interest in expanding it into a book. Walters felt that it would help "tongue-tied, socially awkward people — the many people who worry that they can't think of the right thing to say to start a conversation." She published the book How to Talk with Practically Anybody about Practically Anything in 1970, with the assistance of ghostwriter June Callwood. To Walters' great surprise, the book was a success. As of 2008, it had gone through eight printings, sold hundreds of thousands of copies worldwide, and had been translated into at least six languages. She published her autobiography, Audition: A Memoir, in 2008. ^ "Barbara Walters". Forbes. June 14, 2007. Archived from the original on May 9, 2008. Retrieved May 8, 2008. ^ a b "Miss Walters engaged". The New York Times. May 1, 1955. p. 96. ^ "Barbara Walters: Biography". TVGuide.com. Retrieved February 3, 2014. ^ "Barbara Walters Announces 2014 Retirement – ABC News". Abcnews.go.com. May 12, 2013. Retrieved April 17, 2016. ^ "Barbara Walters returns from retirement for Peter Rodger interview". LA Times. June 10, 2014. Retrieved April 17, 2016. ^ "Donald Trump Responds to Critics: Somebody 'Has to Say What's Right'". ABC News. Retrieved February 21, 2019. ^ Walters, Barbara (2008). Audition: a memoir. NY: Knopf. p. 205. ISBN 978-0-307-26646-0. ^ Meaney, VP-TV News Programming, Donald (April 22, 1974). "NBC-TV Press Release". ^ "Walters to Announce 2014 Retirement on 'The View'". The New York Times. May 13, 2013. Retrieved May 13, 2013. ^ a b Chris Ariens (April 11, 2015). "Barbara Walters Return to 20/20 Wins the Hour for ABC | TVNewser". Adweek.com. Retrieved April 17, 2016. ^ a b "Barbara Walters returns from retirement for Peter Rodger interview". LA Times. June 10, 2014. Retrieved April 17, 2016. ^ a b "Barbara Walters Interviews Presidential Candidate Donald Trump And His Family – ABC News". Abcnews.go.com. November 17, 2015. Retrieved April 17, 2016. ^ a b "Barbara Walters Presents American Scandals : Programs : Investigation Discovery : Discovery Press Web". press.discovery.com. ^ a b "Barbara Walters Reveals Her Annual 'Most Fascinating People' List – ABC News". Abcnews.go.com. December 2, 2015. Retrieved April 17, 2016. ^ "Barbara Walters Biography (1931-)". Filmreference.com. Retrieved April 17, 2016. ^ "Barbara Walters Facts, information, pictures | Encyclopedia.com articles about Barbara Walters". Encyclopedia.com. Retrieved April 17, 2016. ^ "Barbara Walters Biography – life, history, book, information, born, college, contract, house, marriage, time, year". Notablebiographies.com. September 25, 1931. Retrieved April 17, 2016. ^ "Barbara Walters Fast Facts". CNN.com. September 29, 2015. Retrieved April 17, 2016. ^ "Barbara Walters (1931-)". Open Library. Retrieved April 17, 2016. ^ TheBiography.us (October 2, 1931). "Biography of Barbara Walters (1931-VVVV)". TheBiography.us. Archived from the original on April 15, 2016. Retrieved April 17, 2016. ^ "Barbara Walters Birthday - September 25, 1931 - List of Celebrities & their Date of Birth @ Celebritorium.com". ^ "Barbara Walters Facts". Biography.yourdictionary.com. Retrieved April 17, 2016. ^ "Walters, Barbara (1931-) – People and organisations – Trove". Trove.nla.gov.au. Retrieved April 17, 2016. ^ "When was Barbara Walters (newscaster) born? | Old Farmer's Almanac". Almanac.com. September 25, 1931. Retrieved April 17, 2016. ^ "Audition : a memoir : Walters, Barbara, 1931- : Book, Regular Print Book : Toronto Public Library". Torontopubliclibrary.ca. May 13, 2008. Retrieved April 17, 2016. ^ "Barbara Walters Interview | Archive of American Television". Emmytvlegends.org. Retrieved April 17, 2016. ^ "Barbara Walters Interview Part 1 of 4 – EMMYTVLEGENDS.ORG". YouTube. August 28, 2009. Retrieved April 17, 2016. ^ Walters, Barbara (2008). Audition: a memoir. New York: Alfred A. Knopf. p. 9. ISBN 978-0-307-26646-0. ^ Quinn, Sally (December 22, 2006). "Television Personality Looks Anew At Religion". The Washington Post/Newsweek. Archived from the original on January 6, 2007. Retrieved December 22, 2006. ^ Walters, Barbara (2008). Audition: A Memoir. New York: Alfred A. Knopf. pp. 7–13. ISBN 978-0-307-26646-0. ^ "Helping Celebrities Find Their Roots". ^ Walters, Barbara (2008). Audition: a memoir. NY: Knopf. p. 10. ISBN 978-0-307-26646-0. ^ "Lou Walters, Nightclub Impresario and Founder of Latin Quarter, Dies". The New York Times. August 16, 1977. p. 36. ^ Tropicana – Las Vegas Strip. A2zlasvegas.com. Retrieved on October 27, 2011. ^ "Can Barbara Walters's Career Survive Rosie and Donald's War?" New York (March 5, 2007). Retrieved on 2011-10-27. ^ Dowd, Maureen (March 25, 1990). "And Now Back to You, Barbara". The New York Times. Retrieved April 26, 2010. ^ "Barbara Walters Biography". biography.com. ^ "Barbara Walters' legendary career offers a 'View' back to TODAY". TODAY.com. Retrieved February 24, 2019. ^ CNN: 1976 Presidential Debates. Retrieved on June 14, 2008. ^ "Herald-Journal - Google News Archive Search". ^ Maselin, J. (May 5, 2008). "Hard sell, soft touch, and the right question". The New York Times. ^ Walters, Barbara (2008). Audition: a memoir. New York: Alfred A. Knopf. pp. 324–333. ISBN 978-0-307-26646-0. ^ Walters, Barbara (2008). Audition: a memoir. New York: Alfred A. Knopf. p. 327. ISBN 978-0-307-26646-0. ^ Walters, Barbara (2008). Audition: a memoir. New York: Alfred A. Knopf. p. 329. ISBN 978-0-307-26646-0. ^ de Moraes, Lisa (March 5, 1999). "Monica Lewinsky Beats the Competition". The Washington Post. Retrieved May 12, 2013. ^ Shales, Tom (March 4, 1999). "Once More, With Feeling". The Washington Post. Retrieved May 12, 2013. ^ Allen, Nick (March 7, 2010). "Barbara Walters to host last Oscars special amid 'overexposure' of stars". Telegraph. London: Telegraph Media Group Limited 2010. Retrieved March 8, 2010. ^ Carter, Bill (March 28, 2013). "Barbara Walters Said to Be Nearing Retirement". The New York Times. Retrieved April 17, 2013. ^ de Moraes, Lisa (March 28, 2013). "Barbara Walters to announce she's retiring — next year". The Washington Post. Retrieved April 17, 2013. ^ Zurawik, David (March 28, 2013). "Barbara Walters retiring after 52 years in television". The Baltimiore Sun. Retrieved April 17, 2013. ^ Whitaker, Morgan (March 30, 2013). "Barbara Walters, TV trailblazer, set to retire". MSNBC. Retrieved April 17, 2013. ^ Gay, Verne (April 1, 2013). "Barbara Walters on retirement: No comment, but no denial either". Newsday. Retrieved April 17, 2013. ^ Day, Patrick Kevin (April 1, 2013). "'The View's' Barbara Walters has no retirement announcement yet". Los Angeles Times. Retrieved April 17, 2013. ^ Carter, Bill (May 12, 2013). "Walters to Announce 2014 Retirement on 'The View'". The New York Times. Retrieved May 13, 2013. ^ "Barbara Walters to announce retirement on "The View," says ABC". Chicago Tribune. May 12, 2013. Retrieved May 13, 2013. ^ Schwartz, Bruce (May 12, 2013). "Barbara Walters will announce retirement". USA Today. Retrieved May 13, 2013. ^ Ford, Dana (May 13, 2013). "Barbara Walters to retire next year". CNN. Retrieved May 13, 2013. ^ Villarreal, Yvonne (May 12, 2013). "Groundbreaking TV journalist Barbara Walters is set to retire". Los Angeles Times. Retrieved May 13, 2013. ^ "Barbara Walters is Already Set to Interview Again Less Than One Month After Formally Retiring – Jewish Business News". Jewishbusinessnews.com. June 11, 2014. Retrieved April 17, 2016. ^ ""BARBARA WALTERS PRESENTS: THE 10 MOST FASCINATING PEOPLE OF 2014," RETURNS TO ABC PRIMETIME DECEMBER 14, 9-11 PM ET – ABC News". Abcnews.go.com. October 21, 2014. Retrieved April 17, 2016. ^ Lisa de Moraes (December 8, 2015). "[VIDEO] Donald Trump Tells Barbara Walters "I'm Not A Bigot," Clearing That Up". Deadline. Retrieved April 17, 2016. ^ "Barbara's Secret Struggle! 'Gravely' Ill Walters Not Seen In Public For 130 Days". radaronline.com. Retrieved February 9, 2019. ^ "Top-Drawer Life of Barbara Walters". Beaver County Times. Pennsylvania. October 7, 1974. ^ "Walter's fiance is a man of few words, big bucks". The Atlanta Journal-Constitution. June 18, 1985. ^ Miller, Neil (2005). Out of the Past: Gay and Lesbian History from 1869 to the Present. Advocate Books. pp. Ch. 18. ISBN 1-55583-870-7. Archived from the original on September 2, 2009. ^ Wolfe, Tom (April 3, 1988). "Dangerous Obsessions". The New York Times. ^ Wiegand, David (May 5, 2008). "Barbara Walters gets personal. This time, she's candid about her own life". San Francisco Chronicle. ^ Brenner, Marie. "How Donald Trump and Roy Cohn's Ruthless Symbiosis Changed America". Retrieved August 22, 2017. ^ Terry Keenan (September 23, 2007). "LISTEN TO SHILLER, NOT THE TV SHILLS". New York Post. Retrieved October 13, 2007. ^ "The Father of Geriatrics Acted Anything But Old - Ageism - SecondAct.com". web.archive.org. January 5, 2011. Retrieved February 21, 2019. ^ "Barbara Walters: "I Regret Not Having More Children"". The Huffington Post. December 18, 2013. ^ "Barbara Walters' heart valve surgery 'went well'". The Boston Globe. Associated Press. May 14, 2010. Retrieved April 14, 2012. ^ "Making Moves: Thursday, July 8, 2010". Radio-Info.com. July 8, 2010. Archived from the original on July 14, 2010. ^ "'The View' co-hosts through the years: Barbara Walters, Whoopi Goldberg and more". newsday.com. Retrieved February 9, 2019. ^ Past Recipients Archived August 20, 2011, at WebCite. Wif.org. Retrieved on October 27, 2011. ^ "June Callwood interview by Patrick Watson". September 21, 1979. Archived from the original on May 21, 2011. Retrieved October 18, 2009. ^ Maslin, Janet (May 5, 2008). "'Audition: A Memoir' by Barbara Walters". The New York Times. Retrieved December 17, 2016. Gutgold, Nichola D. (2008). Seen and Heard: The Women of Television News. Lexington Books. Wikimedia Commons has media related to Barbara Walters.